'The mission of State Farm is to help people manage the risks of everyday life, recover from the unexpected, and realize their dreams'. 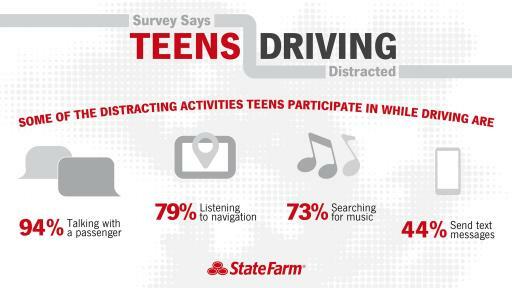 What does surprise me is the lack of eating or drinking while driving being citated at a distraction that teenage drivers take part in while driving. I'ts very common. I assume that, since the US authorities are very focused on the subject of cellphone use and particularly texting (which properly plagues most countries in the union), other distractions are not looked for as well as they could, including eating and drinking while driving, as well as using a hands-free cellphone. I know it's a bad habit, but I still do it when I'm running a tad late, and haven't had breakfast lol. Biscuits are easy - you try opening a bag of Percy Pigs when you're behind the wheel. I saw somebody eating a bowl of porridge while driving in central London once. He rested it on his lap between red lights. You therefore have no excuse to eat biscuits for breakfast. Adamxck wrote: I saw somebody eating a bowl of porridge while driving in central London once. He rested it on his lap between red lights.